Then Thirupperai / Nava Tirupati / Shukra Kshetram / Perai Kshetram is one of the 108 Divya Desams of Lord Vishnu located in Tirunelveli, Tamil Nadu. 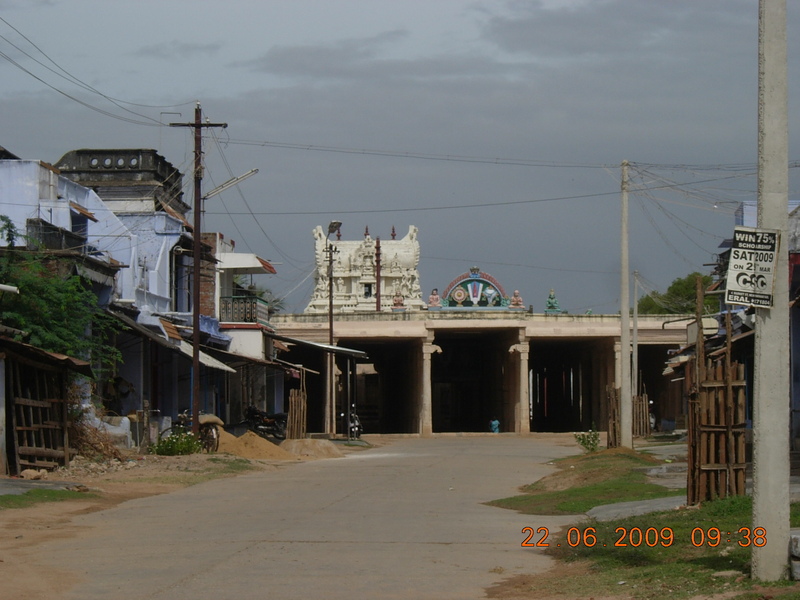 3 kms North East of Thiru Kolur off the Tirunelveli-Tiruchendur highway is the big Nigaril Mugilvannan temple at ThenThiruperai, with the Lord seen in a majestic seated posture facing East. The legend has that Goddess Sridevi had a strange feeling that Lord Vishnu was more attached to Goddess Boodevi because of her stunning appearance. She prayed to Sage Durvassa to have the same exquisiteness of Boodevi. Later, Sage Durvasa was paid a visit to Lord Vishnu and found that Goddess Boodevi on his lap. She forgot to pay any attention and respect to the Sage. 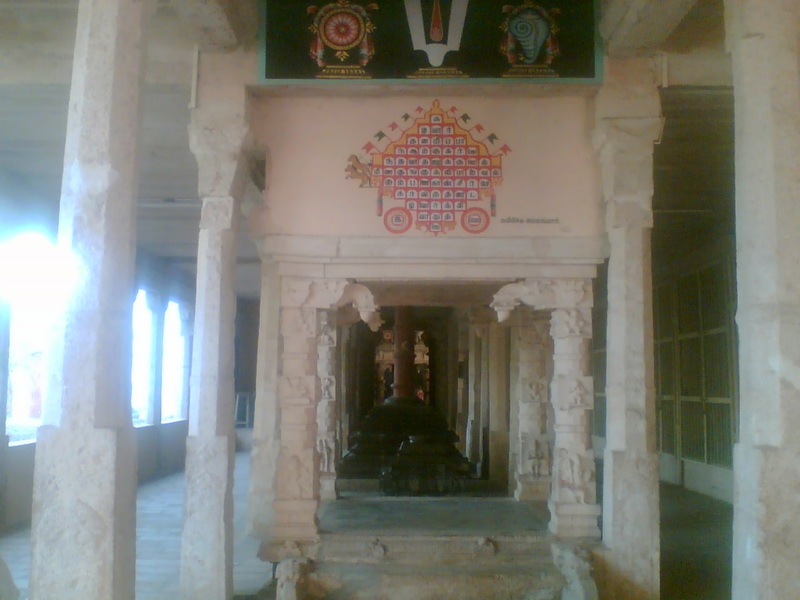 Sage Durvassa, who was well known for his short temper cursed Goodess Boodevi. Goddess Boodevi arrived on this sacred land and underwent severe austerities praying to Lord to regain her status. She slipped her hands together on the river Tamraparni to offer Arghyam to Lord, instantly there appeared striking earrings (Makara Kundalas) of fish shaped and settled on her hands. She offered those earrings to Lord and he wore them happily. 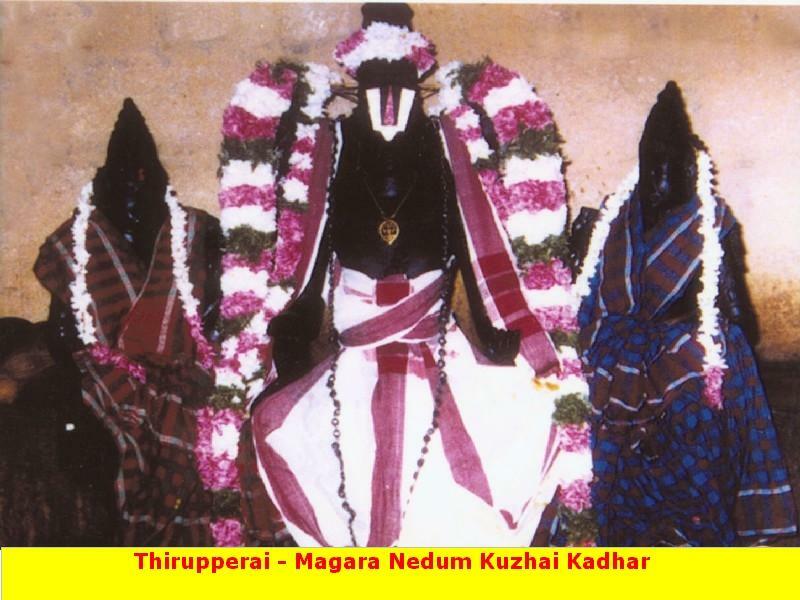 Thus, the presiding deity has got his name ‘Makar Nedunkuzhai Kadhan’. 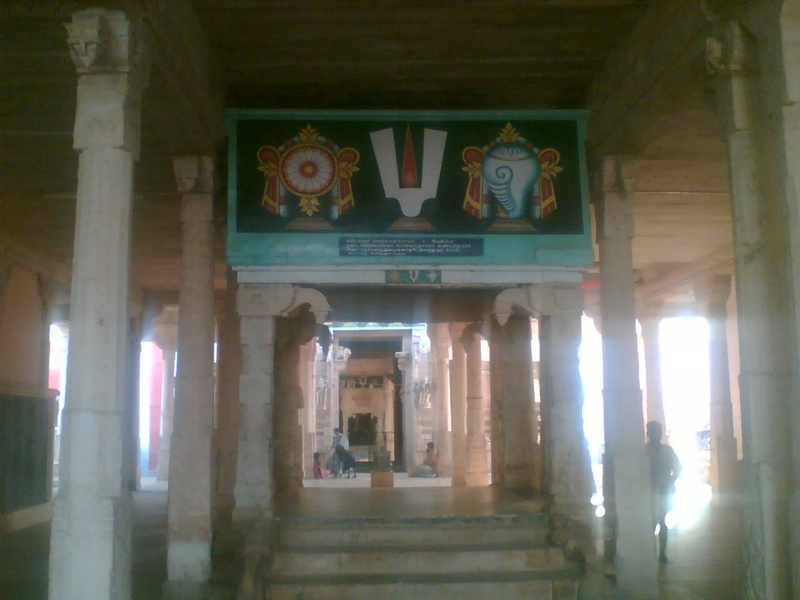 Since Bhoodevi had taken the form and colour of Sridevi (as a result of the curse), this place came to be called SriPerai/ThiruPerai. Having been defeated by the Asuras, Varuna (the Rain God) lost his chief weapon - Pasa Astra (he had earlier insulted his Guru and hence this fate) and undertook penance here. Lord Vishnu is said to have appeared before him on the full moon day in Panguni and helped him recover his lost weapon as well as his powers. As a mark of this episode, it is believed that Varuna, visits this temple, every year, on the full moon day in the month of Panguni (March-April) to worship Vishnu. The Kingdom of Vidharba was affected by severe drought and famine for several years due to a curse. King of Vidharba arrived on this sacred land and worshipped Lord Vishnu and got rid from the curse. Once again the Kingdom flourished with rich natural resources. Another legend has that King Sundara Pandiyan brought 108 Vedic Brahmin who were settled on the river banks of Cauvery and their families to perform austerities on this sacred land. While offering alms to the Vedic Brahmins, one was found missing from the group. King solemnly prayed to Lord to resolve the issue, Lord himself appeared before the King as a Vedic Brahmin to receive alms. Thenthiruperai can be reached by bus from Tiruchandur and Tirunelveli. Yet, a cab will be convenient. The place is 4 km from Azhwar Thirunagari. It is 39 km from Tirunelveli.